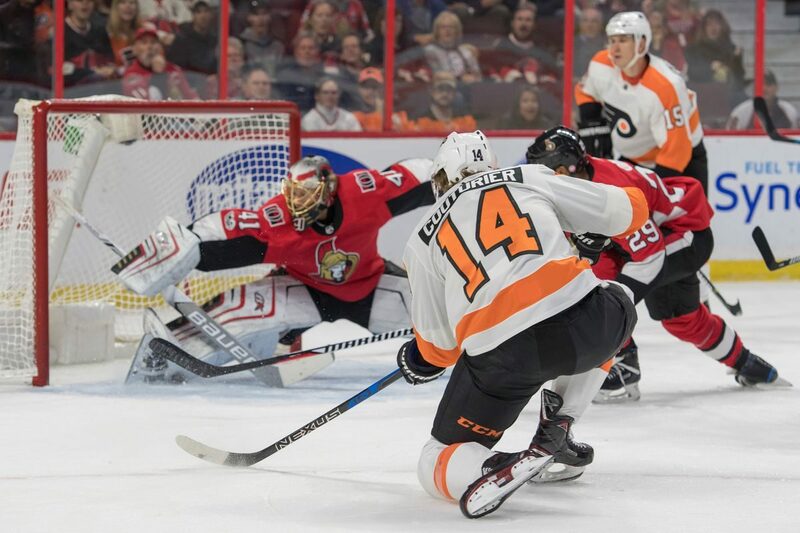 OTTAWA — The Ottawa Senators, playing without three of their top six forwards, hung on to defeat the Philadelphia Flyers 5-4 at Canadian Tire Centre on Thursday. Dion Phaneuf, Mark Borowiecki, Jean-Gabriel Pageau, Mark Stone and Tom Pyatt scored for the Senators (5-1-4). Craig Anderson made 36 saves. Ottawa, which was missing forwards Kyle Turris (illness), Bobby Ryan (broken finger) and Zack Smith(upper-body injury), scored three goals in the opening 13:28. Jakub Voracek, Travis Konecny, Ivan Provorov and Sean Couturier scored for the Flyers (5-5-0). Michal Neuvirth made 23 saves. Provorov and Couturier scored in the final 4:42 of the third period to make it a one-goal game. Provorov cut the Senators lead to 5-3, and Couturier made it 5-4 with 1:46 remaining with his seventh of the season. The Senators have blown a third-period lead three times this season, losing twice in a shootout and once in overtime. It appeared Couturier may have tied the game with 56 seconds left in the third. The Situation Room initiated a review to determine if his shot crossed the goal line, but the play was not reviewable because referee Steve Kozari was in the process of blowing his whistle after losing sight of the puck. Pageau scored his first goal of the season and the 10th shorthanded goal of his NHL career at 13:28 of the first period to give the Senators a 3-0 lead. Phaneuf (1:31) and Borowiecki (9:50) scored earlier in the period. Voracek and Konecny scored 53 seconds apart in the second period to get the Flyers back in the game. Voracek’s pass from behind the goal line deflected in off Phaneuf at 14:30 for his first goal of the season, and Konecny scored on a shot over Anderson’s right pad at 15:23 to make it 3-2. Stone put the Senators ahead 4-2 at 17:37 of the second when he took a pass in the slot from Ryan Dzingel and spun a backhand past Neuvirth. Pyatt scored to make it 5-2 at 10:33 of the third period, 55 seconds after a goal by Philadelphia’s Brandon Manning was disallowed following a challenge by Ottawa coach Guy Boucher because of goaltender interference by forward Jordan Weal. Flyers forward Nolan Patrick, the No. 2 pick in the 2017 NHL Draft, was scratched. He is day to day with an upper-body injury following a hit by Anaheim Ducks forward Chris Wagner in a 6-2 loss Tuesday. Pyatt used Nate Thompson as a decoy on a 2-on-1 and beat Neuvirth with a low shot to the stick side from the right face-off dot. With the Flyers pressing for the tying goal, Anderson got his right toe on a shot by Valtteri Filppula from the low slot with 1:18 left in the third. With the Senators shorthanded, Karlsson stepped up to intercept Konecny’s pass at the Ottawa blue line, carried the puck through the neutral zone and set up Pageau for his goal. Senators forwards Filip Chlapik and Christopher DiDomenico each got his first point in the NHL with an assist on Phaneuf’s goal. … Turris will not play at the New Jersey Devils on Friday, but Smith could return after missing three games.